"Mind transfer" redirects here. For other uses, see Mind transfer (disambiguation). Whole brain emulation (WBE), mind upload or brain upload (sometimes called "mind copying" or "mind transfer") is the hypothetical futuristic process of scanning the mental state (including long-term memory and "self") of a particular brain substrate and copying it to a computer. The computer could then run a simulation model of the brain's information processing, such that it responds in essentially the same way as the original brain (i.e., indistinguishable from the brain for all relevant purposes) and experiences having a conscious mind. Among some futurists and within the transhumanist movement, mind uploading is treated as an important proposed life extension technology. Some believe mind uploading is humanity's current best option for preserving the identity of the species, as opposed to cryonics. Another aim of mind uploading is to provide a permanent backup to our "mind-file", to enable interstellar space travels, and a means for human culture to survive a global disaster by making a functional copy of a human society in a Matrioshka brain, i.e. a computing device that consumes all energy from a star. Whole brain emulation is discussed by some futurists as a "logical endpoint" of the topical computational neuroscience and neuroinformatics fields, both about brain simulation for medical research purposes. It is discussed in artificial intelligence research publications as an approach to strong AI. Computer-based intelligence such as an upload could think much faster than a biological human even if it were no more intelligent. A large-scale society of uploads might, according to futurists, give rise to a technological singularity, meaning a sudden time constant decrease in the exponential development of technology. Mind uploading is a central conceptual feature of numerous science fiction novels and films. Substantial mainstream research in related areas is being conducted in animal brain mapping and simulation, development of faster supercomputers, virtual reality, brain–computer interfaces, connectomics and information extraction from dynamically functioning brains. According to supporters, many of the tools and ideas needed to achieve mind uploading already exist or are currently under active development; however, they will admit that others are, as yet, very speculative, but still in the realm of engineering possibility. Neuroscientist Randal Koene has formed a nonprofit organization called Carbon Copies to promote mind uploading research. Eminent computer scientists and neuroscientists have predicted that specially programmed[clarification needed] computers will be capable of thought and even attain consciousness, including Koch and Tononi, Douglas Hofstadter, Jeff Hawkins, Marvin Minsky, Randal A. Koene, and Rodolfo Llinás. However, even though uploading is dependent upon such a general capability, it is conceptually distinct from general forms of AI in that it results from dynamic reanimation of information derived from a specific human mind so that the mind retains a sense of historical identity (other forms are possible but would compromise or eliminate the life-extension feature generally associated with uploading). The transferred and reanimated information would become a form of artificial intelligence, sometimes called an infomorph or "noömorph". Many theorists have presented models of the brain and have established a range of estimates of the amount of computing power needed for partial and complete simulations. Using these models, some have estimated that uploading may become possible within decades if trends such as Moore's law continue. In theory, if the information and processes of the mind can be disassociated from the biological body, they are no longer tied to the individual limits and lifespan of that body. Furthermore, information within a brain could be partly or wholly copied or transferred to one or more other substrates (including digital storage or another brain), thereby – from a purely mechanistic perspective – reducing or eliminating "mortality risk" of such information. This general proposal was discussed in 1971 by biogerontologist George M. Martin of the University of Washington. An “uploaded astronaut” could be used instead of a "live" astronaut in human spaceflight, avoiding the perils of zero gravity, the vacuum of space, and cosmic radiation to the human body. It would allow for the use of smaller spacecraft, such as the proposed StarChip, and it would enable virtually unlimited interstellar travel distances. 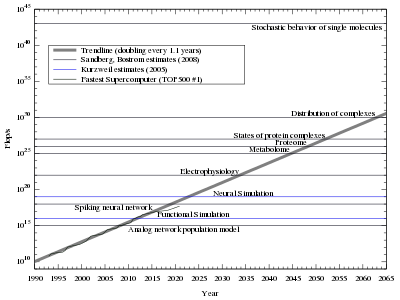 Estimates of how much processing power is needed to emulate a human brain at various levels (from Ray Kurzweil and the chart to the left), along with the fastest supercomputer from TOP500 mapped by year. Note the logarithmic scale and exponential trendline, which assumes the computational capacity doubles every 1.1 years. Kurzweil believes that mind uploading will be possible at neural simulation, while the Sandberg, Bostrom report is less certain about where consciousness arises. Advocates of mind uploading point to Moore's law to support the notion that the necessary computing power is expected to become available within a few decades. However, the actual computational requirements for running an uploaded human mind are very difficult to quantify, potentially rendering such an argument specious. In 2004, Henry Markram, lead researcher of the "Blue Brain Project", stated that "it is not [their] goal to build an intelligent neural network", based solely on the computational demands such a project would have. Metabolism model: The movement of positively charged ions through the ion channels controls the membrane electrical action potential in an axon. Since the function of the human mind and how it might arise from the working of the brain's neural network, are poorly understood issues, mind uploading relies on the idea of neural network emulation. Rather than having to understand the high-level psychological processes and large-scale structures of the brain, and model them using classical artificial intelligence methods and cognitive psychology models, the low-level structure of the underlying neural network is captured, mapped and emulated with a computer system. In computer science terminology,[dubious – discuss] rather than analyzing and reverse engineering the behavior of the algorithms and data structures that resides in the brain, a blueprint of its source code is translated to another programming language. The human mind and the personal identity then, theoretically, is generated by the emulated neural network in an identical fashion to it being generated by the biological neural network. Furthermore, the model may have to include metabolism, i.e. how the neurons are affected by hormones and other chemical substances that may cross the blood–brain barrier. It is considered likely that the model must include currently unknown neuromodulators, neurotransmitters and ion channels. It is considered unlikely that the simulation model has to include protein interaction, which would make it computationally complex. A full brain map has been estimated to occupy less than 2 x 1016 bytes (20,000 TB) and would store the addresses of the connected neurons, the synapse type and the synapse "weight" for each of the brains' 1015 synapses. [not in citation given] However, the biological complexities of true brain function (e.g. the epigenetic states of neurons, protein components with multiple functional states, etc.) may preclude an accurate prediction of the volume of binary data required to faithfully represent a functioning human mind. There are uncertainties with this approach using current microscopy techniques. If it is possible to replicate neuron function from its visible structure alone, then the resolution afforded by a scanning electron microscope would suffice for such a technique. However, as the function of brain tissue is partially determined by molecular events (particularly at synapses, but also at other places on the neuron's cell membrane), this may not suffice for capturing and simulating neuron functions. It may be possible to extend the techniques of serial sectioning and to capture the internal molecular makeup of neurons, through the use of sophisticated immunohistochemistry staining methods that could then be read via confocal laser scanning microscopy. However, as the physiological genesis of 'mind' is not currently known, this method may not be able to access all of the necessary biochemical information to recreate a human brain with sufficient fidelity. The Blue Brain Project by the Brain and Mind Institute of the École Polytechnique Fédérale de Lausanne, Switzerland is an attempt to create a synthetic brain by reverse-engineering mammalian brain circuitry. Underlying the concept of "mind uploading" (more accurately "mind transferring") is the broad philosophy that consciousness lies within the brain's information processing and is in essence an emergent feature that arises from large neural network high-level patterns of organization, and that the same patterns of organization can be realized in other processing devices. Mind uploading also relies on the idea that the human mind (the "self" and the long-term memory), just like non-human minds, is represented by the current neural network paths and the weights of the brain synapses rather than by a dualistic and mystic soul and spirit. The mind or "soul" can be defined as the information state of the brain, and is immaterial only in the same sense as the information content of a data file or the state of a computer software currently residing in the work-space memory of the computer. Data specifying the information state of the neural network can be captured and copied as a "computer file" from the brain and re-implemented into a different physical form. This is not to deny that minds are richly adapted to their substrates. An analogy to the idea of mind uploading is to copy the temporary information state (the variable values) of a computer program from the computer memory to another computer and continue its execution. The other computer may perhaps have different hardware architecture but emulates the hardware of the first computer. A considerable portion of transhumanists and singularitarians place great hope into the belief that they may become immortal, by creating one or many non-biological functional copies of their brains, thereby leaving their "biological shell". However, the philosopher and transhumanist Susan Schneider claims that at best, uploading would create a copy of the original person's mind. Susan Schneider agrees that consciousness has a computational basis, but this does not mean we can upload and survive. According to her views, "uploading" would probably result in the death of the original person's brain, while only outside observers can maintain the illusion of the original person still being alive. For it is implausible to think that one's consciousness would leave one's brain and travel to a remote location; ordinary physical objects do not behave this way. Ordinary objects (rocks, tables, etc.) are not simultaneously here, and elsewhere. At best, a copy of the original mind is created. Neural correlates of consciousness, a sub-branch of neuroscience, states that consciousness may be thought of as a state-dependent property of some undefined complex, adaptive, and highly interconnected biological system. Another potential consequence of mind uploading is that the decision to "upload" may then create a mindless symbol manipulator instead of a conscious mind (see philosophical zombie). Are we to assume that an upload is conscious if it displays behaviors that are highly indicative of consciousness? Are we to assume that an upload is conscious if it verbally insists that it is conscious? Could there be an absolute upper limit in processing speed above which consciousness cannot be sustained? The mystery of consciousness precludes a definitive answer to this question. Numerous scientists, including Kurzweil, strongly believe that determining whether a separate entity is conscious (with 100% confidence) is fundamentally unknowable, since consciousness is inherently subjective (see solipsism). Regardless, some scientists strongly believe consciousness is the consequence of computational processes which are substrate-neutral. On the contrary, numerous scientists believe consciousness may be the result of some form of quantum computation dependent on substrate (see quantum mind). It is argued that if a computational copy of one's mind did exist, it would be impossible for one to verify this. The argument for this stance is the following: for a computational mind to recognize an emulation of itself, it must be capable of deciding whether two Turing machines (namely, itself and the proposed emulation) are functionally equivalent. This task is uncomputable due to the undecidability of equivalence, thus there cannot exist a computational procedure in the mind that is capable of recognizing an emulation of itself. Many questions arise regarding the legal personhood of emulations. Would they be given the rights of biological humans? If a person makes an emulated copy of themselves and then dies, does the emulation inherit their property and official positions? Could the emulation ask to "pull the plug" when its biological version was terminally ill or in a coma? Would it help to treat emulations as adolescents for a few years so that the biological creator would maintain temporary control? Would criminal emulations receive the death penalty, or would they be given forced data modification as a form of "rehabilitation"? Could an upload have marriage and child-care rights? If simulated minds would come true and if they were assigned rights of their own, it may be difficult to ensure the protection of "digital human rights". For example, social science researchers might be tempted to secretly expose simulated minds, or whole isolated societies of simulated minds, to controlled experiments in which many copies of the same minds are exposed (serially or simultaneously) to different test conditions. Emulations could create a number of conditions that might increase risk of war, including inequality, changes of power dynamics, a possible technological arms race to build emulations first, first-strike advantages, strong loyalty and willingness to "die" among emulations, and triggers for racist, xenophobic, and religious prejudice. If emulations run much faster than humans, there might not be enough time for human leaders to make wise decisions or negotiate. It is possible that humans would react violently against growing power of emulations, especially if they depress human wages. Emulations may not trust each other, and even well-intentioned defensive measures might be interpreted as offense. If neuroscience is the bottleneck on brain emulation rather than computing power, emulation advances may be more erratic and unpredictable based on when new scientific discoveries happen. Limited computing power would mean the first emulations would run slower and so would be easier to adapt to, and there would be more time for the technology to transition through society. Improvements in manufacturing, 3D printing, and nanotechnology may accelerate hardware production, which could increase the "computing overhang" from excess hardware relative to neuroscience. If one AI-development group had a lead in emulation technology, it would have more subjective time to win an arms race to build the first superhuman AI. Because it would be less rushed, it would have more freedom to consider AI risks. Greater investment in brain emulation and associated cognitive science might enhance the ability of artificial intelligence (AI) researchers to create "neuromorphic" (brain-inspired) algorithms, such as neural networks, reinforcement learning, and hierarchical perception. This could accelerate risks from uncontrolled AI. Participants at a 2011 AI workshop estimated an 85% probability that neuromorphic AI would arrive before brain emulation. This was based on the idea that brain emulation would require understanding some brain components, and it would be easier to tinker with these than to reconstruct the entire brain in its original form. By a very narrow margin, the participants on balance leaned toward the view that accelerating brain emulation would increase expected AI risk. Waiting might give society more time to think about the consequences of brain emulation and develop institutions to improve cooperation. We understand better human abilities, behavioral tendencies, and vulnerabilities, so control measures might be more intuitive and easier to plan for. Emulations could more easily inherit human motivations. Emulations are harder to manipulate than de novo AI, because brains are messy and complicated; this could reduce risks of their rapid takeoff. Also, emulations may be bulkier and require more hardware than AI, which would also slow the speed of a transition. Unlike AI, an emulation wouldn't be able to rapidly expand beyond the size of a human brain. Emulations running at digital speeds would have less intelligence differential vis-à-vis AI and so might more easily control AI. Even if we better understand human behavior, the evolution of emulation behavior under self-improvement might be much less predictable than the evolution of safe de novo AI under self-improvement. Emulations may not inherit all human motivations. Perhaps they would inherit our darker motivations or would behave abnormally in the unfamiliar environment of cyberspace. Even if there's a slow takeoff toward emulations, there would still be a second transition to de novo AI later on. Two intelligence explosions may mean more total risk. Ray Kurzweil, director of engineering at Google, claims to know and foresee that people will be able to "upload" their entire brains to computers and become "digitally immortal" by 2045. Kurzweil made this claim for many years, e.g. during his speech in 2013 at the Global Futures 2045 International Congress in New York, which claims to subscribe to a similar set of beliefs. Mind uploading is also advocated by a number of researchers in neuroscience and artificial intelligence, such as Marvin Minsky while he was still alive. In 1993, Joe Strout created a small web site called the Mind Uploading Home Page, and began advocating the idea in cryonics circles and elsewhere on the net. That site has not been actively updated in recent years, but it has spawned other sites including MindUploading.org, run by Randal A. Koene, who also moderates a mailing list on the topic. These advocates see mind uploading as a medical procedure which could eventually save countless lives. Many transhumanists look forward to the development and deployment of mind uploading technology, with transhumanists such as Nick Bostrom predicting that it will become possible within the 21st century due to technological trends such as Moore's law. Michio Kaku, in collaboration with Science, hosted a documentary, Sci Fi Science: Physics of the Impossible, based on his book Physics of the Impossible. Episode four, titled "How to Teleport", mentions that mind uploading via techniques such as quantum entanglement and whole brain emulation using an advanced MRI machine may enable people to be transported to vast distances at near light-speed. The book Beyond Humanity: CyberEvolution and Future Minds by Gregory S. Paul & Earl D. Cox, is about the eventual (and, to the authors, almost inevitable) evolution of computers into sentient beings, but also deals with human mind transfer. Richard Doyle's Wetwares: Experiments in PostVital Living deals extensively with uploading from the perspective of distributed embodiment, arguing for example that humans are currently part of the "artificial life phenotype". Doyle's vision reverses the polarity on uploading, with artificial life forms such as uploads actively seeking out biological embodiment as part of their reproductive strategy. Kenneth D. Miller, a professor of neuroscience at Columbia and a co-director of the Center for Theoretical Neuroscience, raised doubts about the practicality of mind uploading. His major argument is that reconstructing neurons and their connections is in itself a formidable task, but it is far from being sufficient. Operation of the brain depends on the dynamics of electrical and biochemical signal exchange between neurons; therefore, capturing them in a single "frozen" state may prove insufficient. In addition, the nature of these signals may require modeling down to the molecular level and beyond. Therefore, while not rejecting the idea in principle, Miller believes that the complexity of the "absolute" duplication of an individual mind is insurmountable for the nearest hundreds of years. ^ Goertzel, BEN; Ikle', Matthew (2012). "Introduction". International Journal of Machine Consciousness. 04: 1–3. doi:10.1142/S1793843012020015. ^ a b c d e f g h Sandberg, Anders; Boström, Nick (2008). Whole Brain Emulation: A Roadmap (PDF). Technical Report #2008‐3. Future of Humanity Institute, Oxford University. Retrieved 5 April 2009. The basic idea is to take a particular brain, scan its structure in detail, and construct a software model of it that is so faithful to the original that, when run on appropriate hardware, it will behave in essentially the same way as the original brain. ^ Goertzel, Ben (December 2007). "Human-level artificial general intelligence and the possibility of a technological singularity: a reaction to Ray Kurzweil's The Singularity Is Near, and McDermott's critique of Kurzweil". Artificial Intelligence. 171 (18, Special Review Issue): 1161–1173. doi:10.1016/j.artint.2007.10.011. ^ Kay KN, Naselaris T, Prenger RJ, Gallant JL (March 2008). "Identifying natural images from human brain activity". Nature. 452 (7185): 352–5. Bibcode:2008Natur.452..352K. doi:10.1038/nature06713. PMC 3556484. PMID 18322462. ^ a b Koch, Christof; Tononi, Giulio (2008). "Can machines be conscious?" (PDF). IEEE Spectrum. 45 (6): 55. doi:10.1109/MSPEC.2008.4531463. ^ a b null. "Tech Luminaries Address Singularity". ieee.org. ^ Marvin Minsky, Conscious Machines, in 'Machinery of Consciousness', Proceedings, National Research Council of Canada, 75th Anniversary Symposium on Science in Society, June 1991. ^ Llinas, R (2001). I of the Vortex: From Neurons to Self. Cambridge: MIT Press. pp. 261–262. ISBN 978-0-262-62163-2. ^ Ray Kurzweil (February 2000). "Live Forever–Uploading The Human Brain...Closer Than You Think". Psychology Today. ^ Martin GM (1971). "Brief proposal on immortality: an interim solution". Perspectives in Biology and Medicine. 14 (2): 339–340. doi:10.1353/pbm.1971.0015. PMID 5546258. ^ Prisco, Giulio (12 December 2012). "Uploaded e-crews for interstellar missions". kurzweilai.net. Retrieved 31 July 2015. ^ "Substrate-Independent Minds - Carboncopies.org Foundation". carboncopies.org. ^ Roadmap p.11 "Given the complexities and conceptual issues of consciousness we will not examine criteria 6abc, but mainly examine achieving criteria 1‐5." ^ "Bluebrain - EPFL". epfl.ch. 19 May 2015. ^ "New imaging method developed at Stanford reveals stunning details of brain connections". Stanford Medicine. ^ Hagmann, Patric; Cammoun, Leila; Gigandet, Xavier; Meuli, Reto; Honey, Christopher J.; Wedeen, Van J.; Sporns, Olaf; Friston, Karl J. (2008). Friston, Karl J. (ed.). "Mapping the Structural Core of Human Cerebral Cortex". PLoS Biology. 6 (7): e159. doi:10.1371/journal.pbio.0060159. PMC 2443193. PMID 18597554. ^ Glover, Paul; Bowtell, Richard (2009). "Medical imaging: MRI rides the wave". Nature. 457 (7232): 971–2. Bibcode:2009Natur.457..971G. doi:10.1038/457971a. PMID 19225512. ^ Franco Cortese (June 17, 2013). "Clearing Up Misconceptions About Mind Uploading". h+ Media. ^ Yoonsuck Choe; Jaerock Kwon; Ji Ryang Chung (2012). "Time, Consciousness, and Mind Uploading" (PDF). International Journal of Machine Consciousness. 04 (1): 257. doi:10.1142/S179384301240015X. ^ "The Duplicates Paradox (The Duplicates Problem)". benbest.com. ^ a b Schneider, Susan (March 2, 2014). "The Philosophy of 'Her'". The New York Times. Retrieved May 7, 2014. ^ Hughes, James (2013). Transhumanism and Personal Identity. Wiley. ^ Wiley, Keith (March 20, 2014). "Response to Susan Schneider's "Philosophy of 'Her"". H+Magazine. Retrieved 7 May 2014. ^ Wiley, Keith (Sep 2014). A Taxonomy and Metaphysics of Mind-Uploading (1st ed.). Humanity+ Press and Alautun Press. ISBN 978-0692279847. Retrieved 16 October 2014. ^ Ruparel, Bhavik (2018-07-30). "On Achieving Immortality". Bhavik Ruparel. Retrieved 2018-07-31. ^ Michael Hauskeller. "My Brain, my Mind, and I: Some Philosophical Problems of Mind-Uploading". Academia.edu. 04 (1): 187–200. ^ George Dvorsky. "You Might Never Upload Your Brain Into a Computer". io9. ^ Ben Goertzel (2012). "When Should Two Minds Be Considered Versions of One Another?" (PDF). ^ Sally Morem (April 21, 2013). "Goertzel Contra Dvorsky on Mind Uploading". h+ Media. ^ Martine Rothblatt (2012). "The Terasem Mind Uploading Experiment" (PDF). International Journal of Machine Consciousness. 4 (1): 141–158. doi:10.1142/S1793843012400070. Archived from the original (PDF) on 2013-08-27. ^ Patrick D. Hopkins (2012). "Why Uploading Will Not Work, or, the Ghosts Haunting Transhumanism" (PDF). International Journal of Machine Consciousness. 4 (1). doi:10.1142/S179384301250014X (inactive 2019-01-29). Archived from the original (PDF) on 2012-09-06. ^ a b c d e Anders Sandberg (14 Apr 2014). "Ethics of brain emulations". Journal of Experimental & Theoretical Artificial Intelligence. 26 (3): 439–457. doi:10.1080/0952813X.2014.895113. ^ Jack McKay Fletcher (December 2015). "A computational mind cannot recognize itself". Technoetic Arts. 13 (3): 261–267. doi:10.1386/tear.13.3.261_1. ^ a b Tyler D. Bancroft (Aug 2013). "Ethical Aspects of Computational Neuroscience". Neuroethics. 6 (2): 415–418. doi:10.1007/s12152-012-9163-7. ISSN 1874-5504. ^ a b c d e f g h i Peter Eckersley; Anders Sandberg (Dec 2013). "Is Brain Emulation Dangerous?". Journal of Artificial General Intelligence. 4 (3): 170–194. Bibcode:2013JAGI....4..170E. doi:10.2478/jagi-2013-0011. ISSN 1946-0163. ^ a b Kamil Muzyka (Dec 2013). "The Outline of Personhood Law Regarding Artificial Intelligences and Emulated Human Entities". Journal of Artificial General Intelligence. 4 (3): 164–169. Bibcode:2013JAGI....4..164M. doi:10.2478/jagi-2013-0010. ISSN 1946-0163. ^ Shulman, Carl; Anders Sandberg (2010). Mainzer, Klaus (ed.). "Implications of a Software-Limited Singularity" (PDF). ECAP10: VIII European Conference on Computing and Philosophy. Retrieved 17 May 2014. ^ a b Hanson, Robin (26 Nov 2009). "Bad Emulation Advance". Overcoming Bias. Retrieved 28 June 2014. ^ Muehlhauser, Luke; Anna Salamon (2012). "Intelligence Explosion: Evidence and Import" (PDF). In Amnon Eden; Johnny Søraker; James H. Moor; Eric Steinhart (eds.). Singularity Hypotheses: A Scientific and Philosophical Assessment. Springer. ^ a b c Anna Salamon; Luke Muehlhauser (2012). "Singularity Summit 2011 Workshop Report" (PDF). Machine Intelligence Research Institute. Retrieved 28 June 2014. ^ a b c d e f g h i j k l m Bostrom, Nick (2014). "Ch. 14: The strategic picture". Superintelligence: Paths, Dangers, Strategies. Oxford University Press. ISBN 978-0199678112. ^ "Mind uploading & digital immortality may be reality by 2045, futurists say - KurzweilAI". kurzweilai.net.